Like Stephanie Land, I’ve been a Solo Mom for most of my oldest child’s life, so I knew when I picked up her book that her story would resonate. But I didn’t expect to ugly sob over the deep connection I felt with her experiences as a Solo Mom. Although single moms reading this book will relate to Land’s words in ways others may not, I recommend this book to anyone facing an uphill battle or who dreams of bigger things. Maid (forthcoming from Hachette Books, January 22, 2019) inspires five important lessons that I’m proud to carry with me and share with you. 1. You can find purpose, even when you’re at your lowest. 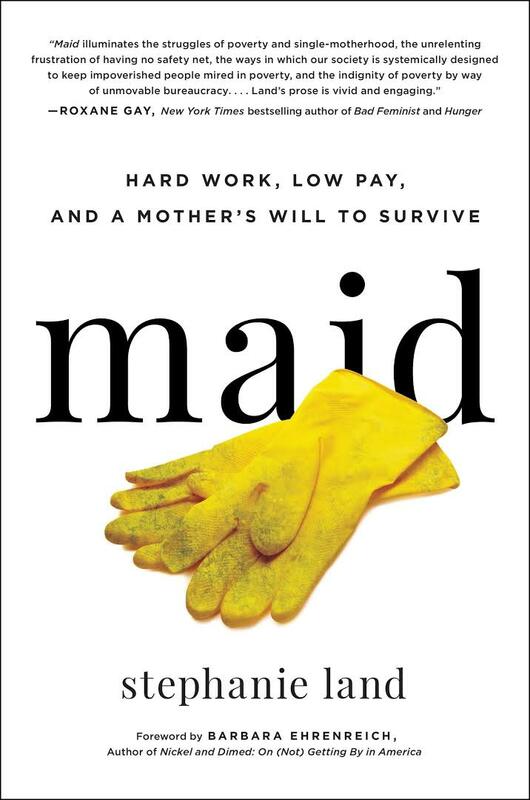 In the opening chapter of Maid, you learn very quickly that Land and her firstborn daughter, Mia, were living in a homeless shelter after Land left Mia’s father. Land’s experiences during this time gave her the drive, motivation, and courage to talk about the disparities she experienced as a Solo Mom in terms of poverty and motherhood. I realize now that during my own lows, I was exposed to important issues and feelings that shape who I am today. By applying our experiences and lessons learned, we not only help other Solo Moms find comfort in knowing they are not alone but also help effect change in our communities and, over time, the world. Throughout the book, Land details her relationships with men, who saw her only for who she was during that time: a woman who cleaned homes. They weren’t able to see her future potential, clearly never expecting she would follow through with her dream of moving to Montana, getting a degree, and becoming a published writer. 3. Good health is paramount. Throughout Maid, Land and Mia battled illnesses, particularly those associated with black mold, which was prevalent in the Northwest region where they lived. For many Solo Moms, any time a family member is ill, it means lost wages—which means less income earned and likely falling behind on bill payments, increasing the risk of homelessness. It is vital for Solo Moms to protect our health by taking good care of ourselves, even if we have to get creative on what qualifies as self-care. The fact is, many of us, even if we aren’t currently living in impoverished circumstances, are just one chronic illness away from homelessness. 4. Don’t be ashamed to ask for help. Like many Solo Moms, Land used programs designed to help families living below the poverty line. She recalled at one point using seven types of aid to make ends meet. Many of us facing poverty have been shamed for tapping into these resources. Too many of us don’t realize how close we are to being in similar circumstances because of reasons beyond our control. There is no shame in asking for help during a difficult time. Never allow someone to make you feel inferior for doing so. The only thing that matters is finding a way to provide for your family. 5. Your struggle is part of the process. The truth is, as a Solo Mom, I needed this book in my life right now because I’ve been struggling. This book showed me my struggle is part of the process and that I’m still capable of being a successful mother and professional—even when it feels like I’m barely keeping my head above water. The book inspired me to not give up, to keep pushing and grinding because the experiences I have today will help provide for a better life tomorrow. The overriding theme in the book is about making her daughter’s life better. Every move Land made—the social programs she used, the jobs she took, and even the financial choices she made—was for her daughter. As Solo Moms, we want to give our children the best of everything, even the things that are seemingly impossible. Maid reminded me to never give up my will to provide for my family and improve my children’s lives because hard work, dedication, and courage can move a mountain.